I picked up my foster potcake from the airport last night. I am going to say foster a lot, but you guys she is so sweet, Ruby is thrilled, and she's been very easy thus far, but I know the poor thing is probably shell-shocked. I loved the whole experience of picking her up, visiting with the other rescue people, and driving home with a weary traveler. Ruby was a maniac when I introduced them through the dog gate and I was initially thinking "oh, no, what have I done!" I couldn't really think of a better way to do the introduction on my own. Ruby was in barrier frustration overdrive, but once I took them for a walk outside things calmed down. Fostercake was very uncertain and didn't want to come back in the house at first, but pretty soon they were playing chase on the patio, and shortly thereafter, wrestling in the dog bed. She was very tolerant of Ruby, who can be overzealous and doesn't know when to quit. Fostercake is really gentle - she takes treats more softly than any dog I've ever met. She was respectful of my elder kitty, and put herself to bed in the crate. She had a couple of accidents, which is to be expected, and has some itchiness that I'm going to combat with a bath and supplements for the time being. Ruby arrived very itchy, too, and it resolved fairly quickly. I was able to take the morning off from work and the girls played a short game of tug with the rubber SuperTug and had an antler-chewing party before taking naps. We were up late and rose early this morning - I was hoping for a nap myself! I just love the little stripe of white on her belly! And her wrinkly forehead and gremlin ears! Excuse the disjointed post - I wanted to share pictures but am not very eloquent today on five hours of sleep! We're having a terribly windy day here today and in the interest of keeping things low-key, did not take a walk this morning. Ruby is nervous in the wind and it seems fostercake might be, too. 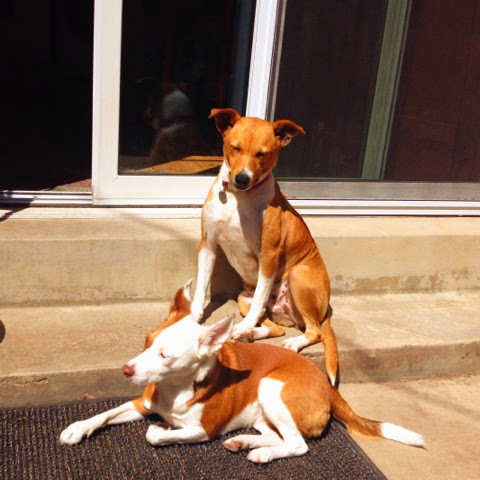 The girls did soak up some sun on the patio before I had to leave for work. Ruby had no issue with being separated in the kitchen while fostercake stays in the crate in the living room - just a slightly modified workday routine for her. 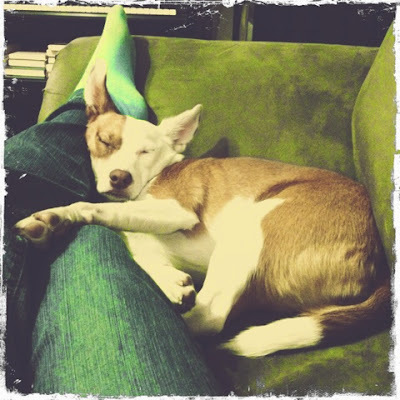 Fostercake seems content to catch up on her rest. I'll be so happy to see them again this afternoon! I was in the middle of grocery shopping after work Wednesday night when I heard the first ominous rumble of thunder. I hurried as much as possible, knowing poor noise-sensitive Ruby was probably frightened at home, and got absolutely soaked running to my car with my cart. As I unlocked the door I didn't see Ruby in her bed and found that she was hiding under the table. She came right over to me, and practically crawled into my arms. The worst of it was over, but I learned some things as the storm passed us by. The Thundershirt really does work! I noticed an almost immediate difference when I swaddled Ruby up in her Kelly green Thundershirt. She stopped trembling and followed me around while I put the groceries away. I've used it a few times to help Ruby's anxiousness in the car, but never during an actual thunderstorm. 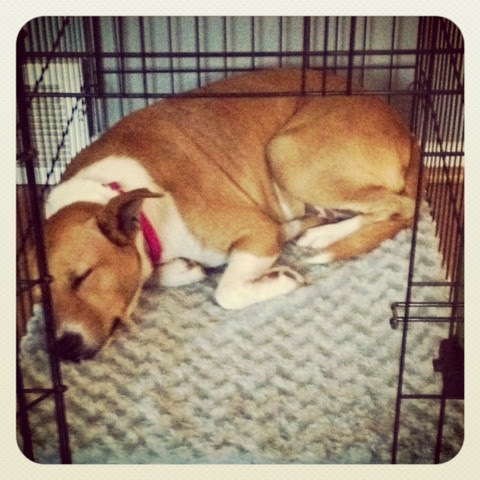 The day I adopted Ruby we drove home in a a downpour and deafening claps of thunder. She didn't seem to mind it, but as I'll talk about in the next point, she was not quite herself at first. Our thunderstorm season in Colorado is generally in the late summer, so yesterday's weather was unexpected. I'm glad to know the Thundershirt helps and we'll be prepared when the next one rolls in. I completely misread Ruby when I first adopted her. I knew this already but the thunderstorm experience only proved to strengthen the realization. Ruby curled up in my lap for close to an hour when I got home, a time she is normally bouncing off the walls bringing me one toy after another and begging for a walk. She didn't whine, but she did press close against me and yawn a lot, a classic sign of stress. 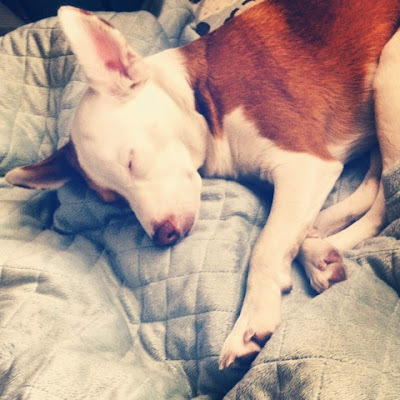 What I thought was calm and cuddly when I took her to a sidewalk cafe, farmers market and the Warrior Dash shortly after adopting her was actually intimidated and afraid. I couldn't understand the sudden change when her reactivity began to surface, but now believe she was actually in a defensive, shut-down state those first few weeks. She was so overwhelmed by everything that she couldn't react to any one thing. I have a hard time forgiving myself for this. There is no such thing as rewarding fear. As I held Ruby in my lap and spoke softly to her, stroking her ears back against her head to possibly muffle some of the sound, I didn't think for a moment that I was reinforcing her fear. That notion always sounded suspicious to me, and it never stopped me from comforting my dogs when they needed it. The attention in combination with the Thundershirt seemed to relax Ruby, it certainly did not cause her to shake or worry more. As always, Patricia McConnell says it better. Ruby and I were both ready to go to bed early last night. She finally did eat her dinner and shared some veggies with me while I watched TV, but wasn't up to her usual shenanigans. I could tell that the storm wore her out. Keep this in mind if you have an anxious or fearful dog, and don't ask too much of them after they've had a trying experience. Sometimes those behaviors that happen "out of nowhere" are the trickle-down effect of compounded distress. I could tell that Ruby was starting to feel better as the loudest part of the storm was over, although it continued pouring all through the night, preventing us from taking our evening walk. She started rolling around on the carpet and so I took her Thundershirt off. 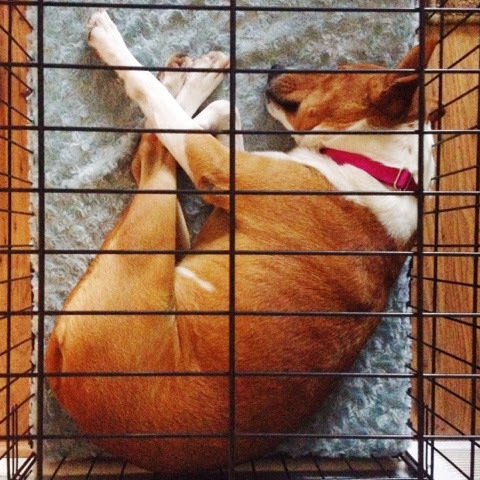 Her tail began wagging again and while she was more subdued than normal I could tell that she was feeling better. Fear can paralyze us in the moment and send us running for cover, but I'll take this opportunity to be dangerously corny, give a nod to one of my favorite movies, The Crow, and say "it can't rain all the time." Ruby's aptitude for learning tricks is remarkable, and seemingly only limited by my imagination and sometimes her cautiousness (she doesn't like going into small spaces or standing on anything that wobbles, for instance). The latest thing we are working on I have cued "march," and it's like chorus-line kicks or Spanish Walk if you're of an equestrian mind, where she alternately raises her front legs up high. Ruby already shakes with both paws (I use "paw" for left and "other" for right) so it was easy to translate from a standing position (she also knows "stand'). I am combining the hand cue with lifting up my foot on the side I want her to raise (mirroring her) and hope to eventually phase out the hand cue. She seems to do better if I am moving slightly backward, so she is walking as she flings her feet out. It's pretty cute. 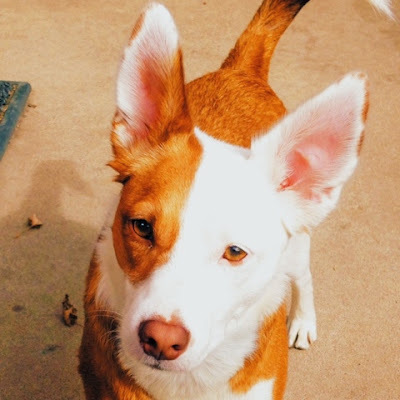 I have decided to apply for her Trick Dog Title through Do More With Your Dog - going through the list she already knows enough to be eligible for the Intermediate level! It will be a nice way for us to accomplish something without having to stress us both out in public, since you can perform all the tricks at home and have a witness sign off on the application. Keep the Tail Wagging - Kimberly's podcast is the one that started it all and had me searching for more of these wonderful audio installments about dogs. I get so excited whenever I see there is a new episode and can't wait to hear what she's been up to with her two sets of littermates: adults Sydney and Rodrigo and puppies Scout and Zoey as well as learning about raw feeding and raising dogs naturally. It's like a 20 minute chat with a fellow dog lover, and in fact I was interviewed for Episode 15, which was so much fun! 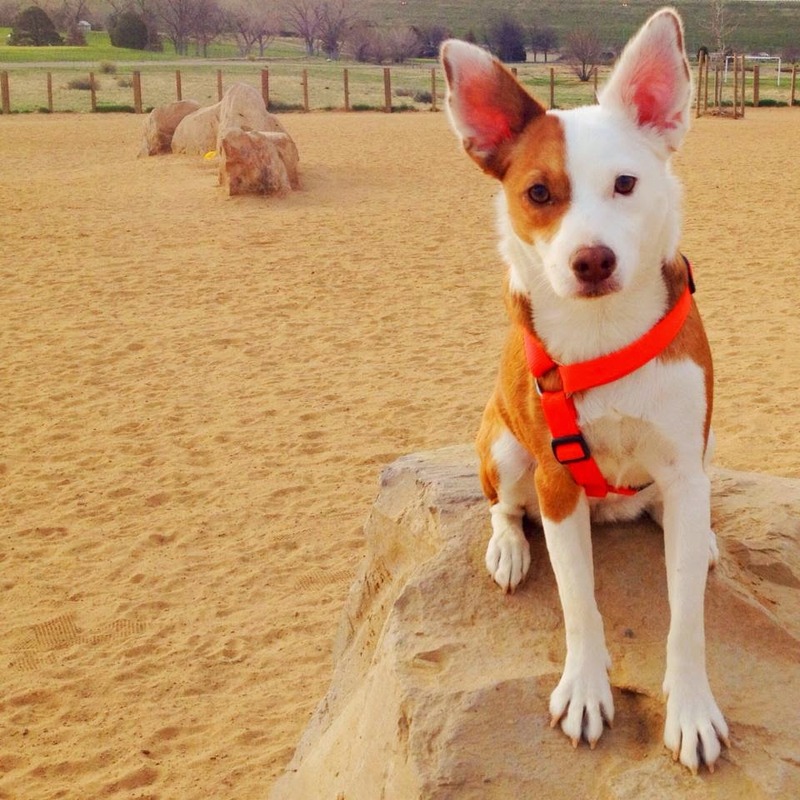 The Great Dog Adventure - This podcast is hosted by Fern Camacho, a dog trainer, rescue advocate and owner of a 13 year old pit bull, Hailey. I find this one wonderfully informative, as Fern brings guest experts on the show to talk about everything from the loss of a pet to making the best choice's for your dog's diet. 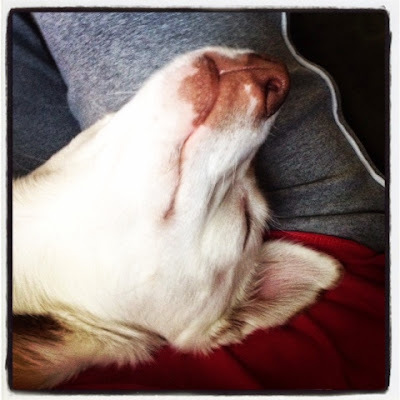 Victoria Stilwell Positively Podcast - Victoria Stilwell is a positive-reinforcement trainer famous for her television program "It's Me or the Dog." I enjoy listening to her English lilt and her encouraging advice for solving behavioral problems, as well as topics such as canine allergies. Doggy Dog World Radio - This podcast is hosted by trainer and author Liz Palika, and it's one I've just started listening to. She brings guest speakers on and it is akin to sitting around with your dog buddies talking about issues and experiences. I recently listened to the episode on the loss of a dog and I appreciated its depth and honesty as the host and guests talked about their own grieving processes. 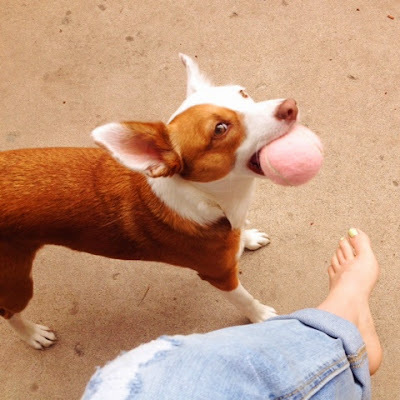 Do More With Your Dog - Host Kyra Sundance is a stunt dog trainer and founder of the Trick Dog Title Program . 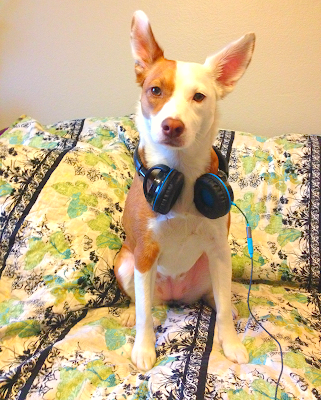 Her podcast features training tips and friendly discussion with co-host Abbey Hood. They can get a little off-track sometimes but as trick-training is one of favorite hobbies with Ruby, I usually garner something useful from each episode. 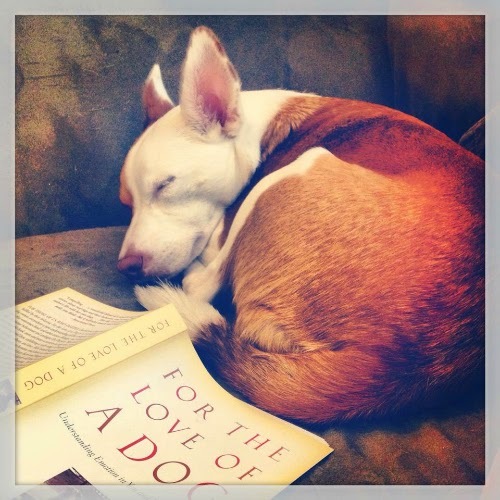 Do you have a favorite dogcast you'd like to share? Ruby and I had the dog park all to ourselves at 6:30 on Saturday morning. I love the crinkle in her ears here - this is the level of intensity she has for her flying disc. I thought her harness was too bright at first, but it's really grown on me. It's lucky we had this outing, because on Sunday it started raining and never stopped, unless you count turning to snow. April in Colorado is always unpredictable. This is a Blog Hop! Powered by Linky Tools. Recently I read a post over at My Imperfect Dog about the pervasive presence of aversive training tools in online and brick-and-mortar pet retailers. This led me to do a lot of research of my own and to immediately begin to make changes in my consumer habits. With a sinking heart I found that I'd been promoting one major online retailer with monthly product reviews who offers page after page of "e-collars" (a quieter way to say "shock collar") and invisible fencing alongside sickening copy that tries to make humorous light out of physical punishment. The language disguises the fact that these devices cause pain with descriptions of "harmless static" and appeases any feeling of guilt with references to "fur babies" and "parents" and "love." The more I looked, the more I found these devices everywhere, offered by almost every major pet chain, along with hundreds of reviews from customers who were satisfied with the "sweet revenge" and "attitude adjustments" that their purchases offered. I read heartbreaking stories about dogs who had been trained with an invisible fence system who were terrified to leave the house, about a pair of dogs wearing remote training collars whose owner mixed up the controllers and was unknowingly shocking the crated dog instead of the dog in the field. 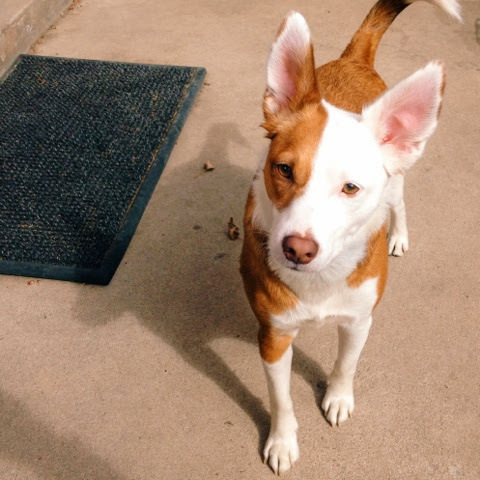 Arguments are made that in the hands of experienced trainers and with well-adjusted dogs, these tools can be used effectively and without undue distress for the dogs. 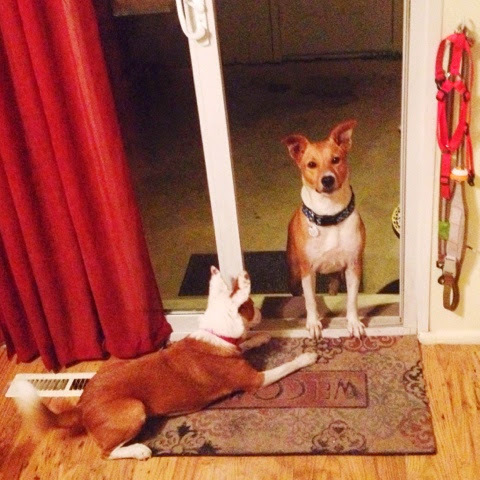 These arguments do not address the numbers of inexperienced people reaching for these tools for fearful or anxious dogs with behavior problems ranging from jumping on visitors to barking, using them without precision of timing or clarity of association, and potentially creating lasting psychological damage. I also read some articles by "balanced trainers," those that are not opposed to using physical correction if the situation warrants it, just to see if I could be at all swayed. Whatever justification is used, I still could not imagine a scenario where I would willingly and deliberately cause pain or the fear of pain to my dog today. 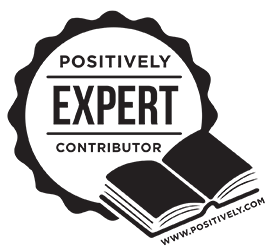 The science of positive reinforcement training is undeniable and its message is becoming more and more widespread. 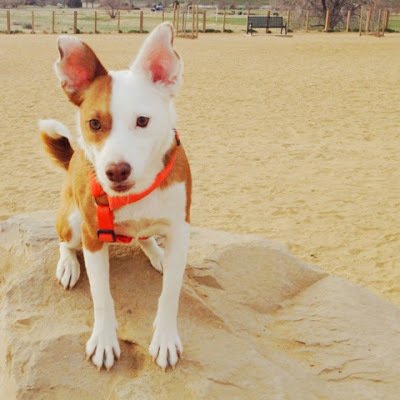 Here is an excellent explanation of why balanced training can create a spiritless or shut-down dog from the Smart Dog Blog. If you have the stomach for it, Eileen and Dogs has collected side by side video examples of dogs being trained using shock collars vs. dogs being trained using positive reinforcement. 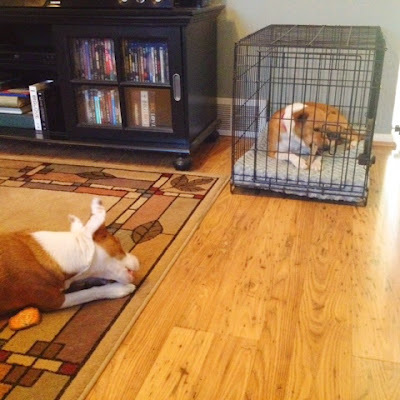 It doesn't take an expert to determine which dogs are enjoying the training sessions. Electronic collars, prong collars and choke chains are tools that work using positive punishment and negative reinforcement methods. In my professional opinion, they are more harmful than helpful in training. A dog's throat is a very sensitive space, and I believe that anything strapped to a throat shouldn't be used for administering punishment or corrections. 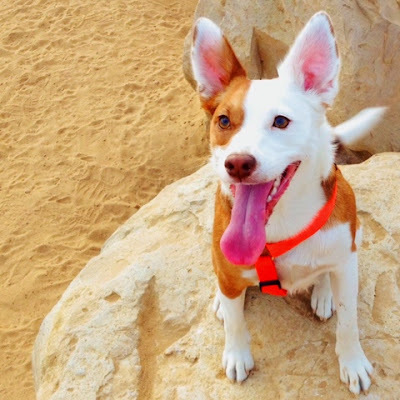 The trachea and thyroid gland can be affected, and harsh corrections can yield even worse damage; e-collars have also been shown to have a lasting psychological effect on dogs, causing them to be more anxious and fearful. Is this what we really want, when we have better options? It is extremely important to always keep the perspective of the dog in mind, and to use the most humane tool possible for training. I believe that we should always weigh our choices carefully and put humane treatment at the forefront of how we interact with our animals. When we work with our dogs to help them make the right decisions and be reinforced, rather than coerced, we can lead happy, full lives together built on trust. And that's what makes training awesome and fun for both dog and human! Imagine if our primary goal for each dog-training lesson, class or consultation was to increase the comfort and joy of every creature in the room: dogs, human students and trainers. Comfort and joy. This is what training and communication means to me, from starting my own horse to teaching a new trick to Ruby, and the heart of why I have embraced positive reinforcement training. It will come as no surprise that I am strongly opposed to the use of aversive training tools such as choke, pinch and shock collars. I don't need articles like this one to convince me. Having a sensitive dog like Ruby has made me even more aware of every training decision I make, and I would much rather exchange a currency of treats than one of threats. This puts me firmly on one side of the spectrum, and there are of course many on the opposite side who have no problem with incorporating fear, discomfort and pain into their training regimen, justifying the means to the end. Results-oriented trainers with guarantees, people who believe dogs are merely property or workers who must earn their keep. These are not the minds I set out to change, but rather those of dog owners somewhere in the middle, the new owners, the desperate owners, the ones who simply don't know and reach for a pinch collar because a big-box pet store employee suggests it (like I did years ago with my first dog), or because that's the first thing they see on the 'Training' page of an online retailer. Amazon UK has recently taken pinch collars off of their website and the Kennel Club UK is urging a ban on shock collars. While large corporations will not miss a handful of customers, we do have power as consumers, we do have a collective voice amplified by our spending. 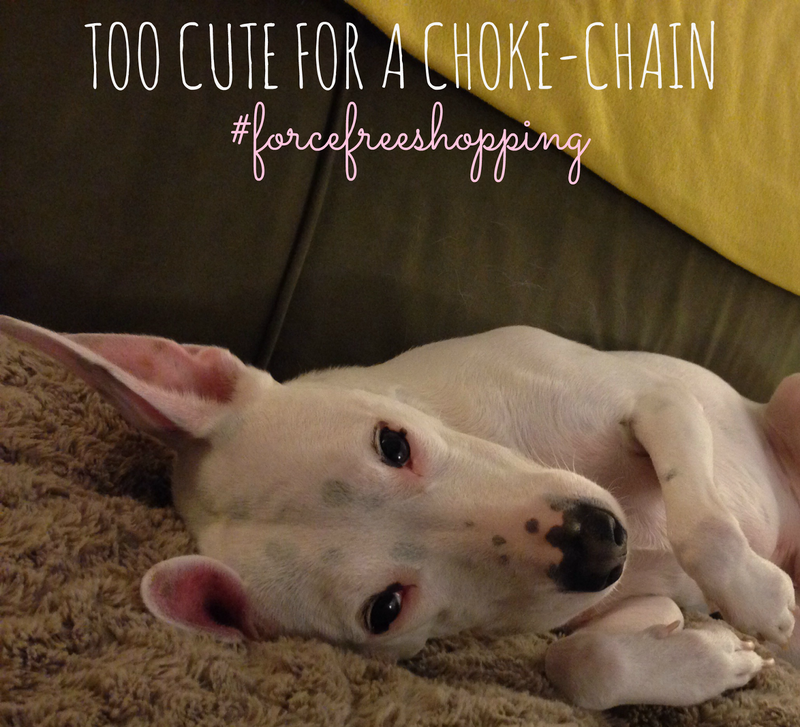 For my part, I will no longer be doing product reviews for any company that sells or manufactures choke, pinch or shock collars. I will write letters to retailers explaining the withdrawal of my business. I will not patronize the big-box pet stores which offer aversive collars on their shelves, instead supporting independent local businesses and smaller chains like Kriser's which promote reward-based training. Jessica and I have begun compiling a Pinterest board of retailers that do not carry harsh aversive training tools, and her post details the steps you can take as a consumer to vote with your shopping habits and the communications she's had with some retailers. Pet-related spending hit a record high of $56 billion in 2013 - that's billions of dollars of influence. I urge you to examine your training values and your shopping options and determine if they are in harmony. 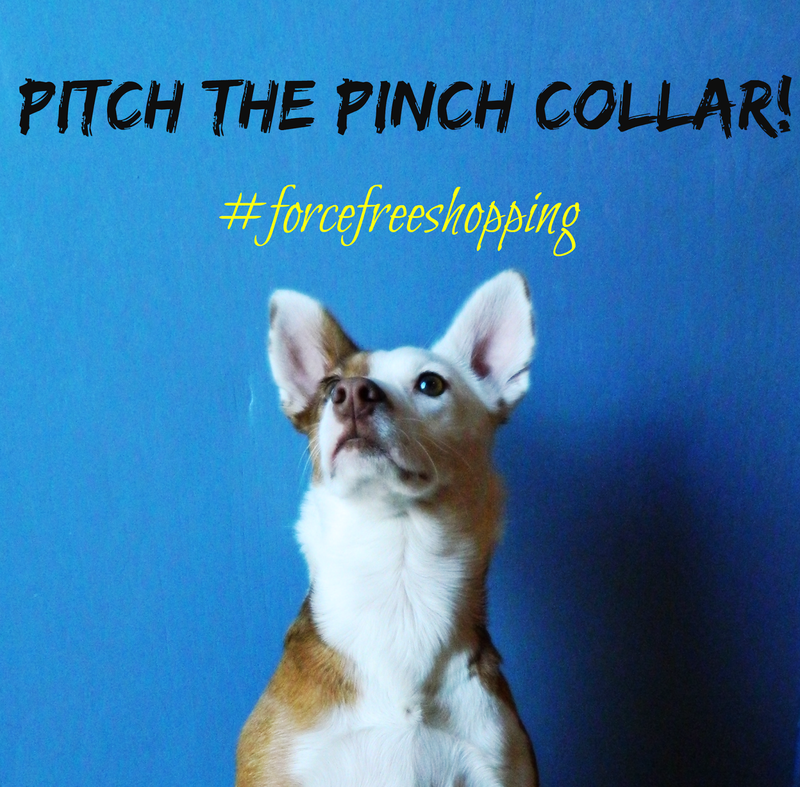 Let those retailers who choose to carry choke, pinch and shock collars know that you'll be taking your business elsewhere and why. Take the time to thank the stores that highlight treat bags and clickers in their training aisle - shop with the power of positive reinforcement. 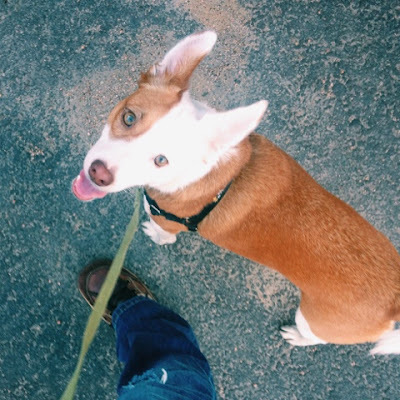 Every day I am learning more about my own training philosophy and how to articulate it, and ultimately I would hope that every person asks themselves how they can do better by their dog. Choosing where to spend my pet budget and spreading the word about these choices is just one small way that I can be the change for animals. 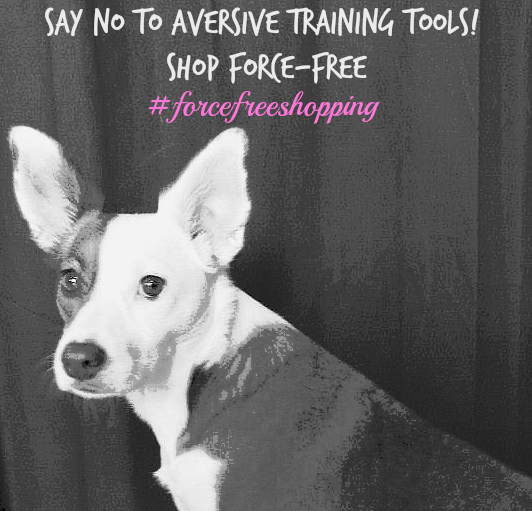 If you'd like to join us, please grab a badge, share the #forcefreeshopping hash-tag, and help say no to aversive training tools. Ruby has a new dog walker that we're both very happy with. They've been going on mini-walks around my complex and running through her tricks. The notes that I've received on her wipe-board or in email updates include "wonder dog," "smart cookie" and "very impressive." She is all of those things and sometimes I feel Ruby is too cool for me. Even my father, who would not call himself a dog person, says that Ruby is the smartest dog he's ever met, and we have had some truly bright family dogs. Does her brilliance have anything to do with her reactivity and vice versa? I believe that it does. 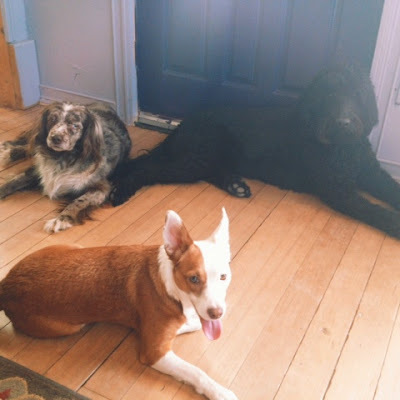 Herding dogs, well-known to be among some of the most intelligent, are also fairly prone to reactivity. She notices and remembers everything, and while this can mean she spots every dog in the distance and makes our walks challenging, it also means she learns very quickly and understands things with a depth that is astonishing to me sometimes. As someone who considers herself somewhat of an intellectual, I admire and appreciate Ruby's intelligence. I could see it in her eyes when I was looking for potential dogs to adopt - I was riveted. I still am. I also adore how playful she is. When I get home the first thing she does is scamper off to get one of her toys - usually her Kong Genius or her yellow Kyjen squirrel. We never skip at least one daily tug session. One of her greatest joys is stealing a sock from the laundry and leading me on a merry chase through the house with it. I suppose this could be considered misbehavior, and I'll admit if I'm in a rush or I've already rescued four or five socks from her jaws, I'm not always an enthusiastic playmate, but her undeniable glee prevents me from denying her thieving romp. Her attentiveness adds a richness to our relationship that I haven't experienced before with a dog. She nearly always follows me from room to room, appears to listen intently to everything I say, and wants to be involved in whatever is happening. Even when there are other dogs or people around, it's clear that she doesn't want to be far away from me for long. When she chooses to snuggle up against my leg while I'm reading or curl up at my feet while I'm writing, even when she wants to chew her stinky catfish skin on my lap, I feel lucky and loved. Because she is so sensitive, I have to be aware and accountable for every interaction with her. I can't be lazy, I can't be impatient. 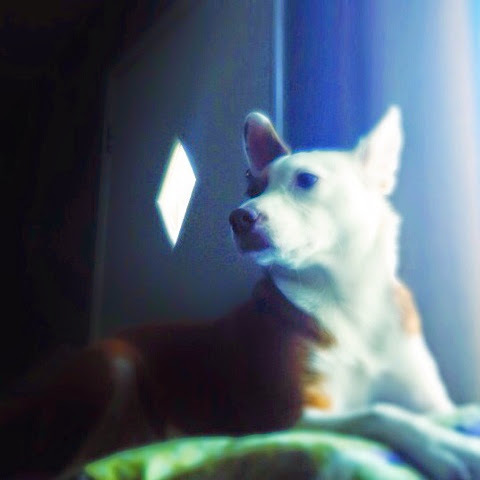 I have to look beyond momentary frustration and reach for the enduring good - the grace - as described by My Imperfect Dog. She requires me to think harder, try again, and question motivations. I've been inspired to learn more about dogs and their behavior in these eight months with Ruby than in my previous lifetime with them. Ruby helps me strive to be my best self, and that may be what I love about her most of all. Our weather this past weekend was not as spring-like as I had hoped, with quite a lot of chilly wind, but there are some undeniable signs cropping up that warm my spirits: grass-stained paws, shedding horses, new foals, tiny purple flowers emerging from dormant ground. Ruby and I spent a couple of days among friends, family, and playmates in Peyton and Colorado Springs. After our usual stop at the feed store we ventured on to my former riding instructor's home for some tea, writerly chat and equine shenanigans. Ruby's second-favorite labradoodle lives there; he and a gingerly corgi fellow play with Ruby in shifts allowing much-needed breath-catching and drool-drying time (for them, not Ruby, who ran laps around the yard by herself while the others watched). 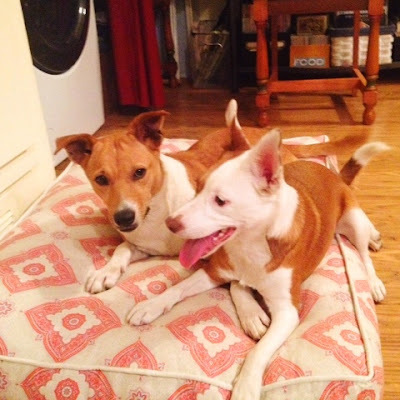 Ruby is so happy in the company of other dogs - it's made me all the more excited for our Bahamian Potcake to arrive! 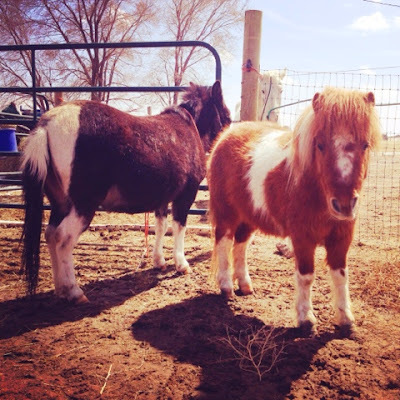 The humans spent some time observing the humorous antics of Pippi the mini-mule and Bhim the mini-horse, who would like you to know that he is very tough, very fancy and very brave - little king of all he surveys. Bhim is a rescue horse from Ruby Ranch Horse Rescue, in training with my friend (although with his vibrant personality we have to wonder who is training who!) He is yet another example of the resilient spirits of second-chance animals. He just happens to be my favorite colorway, too. I think he and Ruby could put on a real dog-and-pony show! Even though Ruby was outdoors with her dog-friends, it was endearingly flattering that she kept her eye on me the entire time we were in the horse pens. She immediately curled up in the backseat after we said reluctant goodbyes and continued on to visit my own horses and brush whirlwinds of black and white hair into the swirling gusts. Ruby spent the evening playing and relaxing with her cousins at my aunt's house while we went out to a delicious Spanish tapas dinner. This was a wonderful treat for me since I'm coming up already on the one-year anniversary of my trip to Spain. The next morning, Ruby showed off some of her tricks for my grandmother. I've been working on changing the cue for her hind leg lift to the far more amusing "how do boys pee?" and my grandmother got a big kick out of that. My aunt and I went out to breakfast and visited some estate sales, where characteristically my only purchase was a dog dish. Ruby slept all the way home, and my dad who had come down for the weekend said he had never seen her so subdued! She snoozed away the rest of the afternoon and evening. On Sunday we had a quiet day at home catching up on laundry and cleaning. I took Ruby into a nearby vacant field where she likes to dig on the hillside and we saw a large, healthy garter snake! Ruby was definitely curious but appropriately cautious, which I was glad to see. Some of the hiking areas near us are prime rattlesnake country. Ruby was remarkably still tired and I took full advantage of a lazy day, reading Plenty In Life Is Free. This slim booklet is a new favorite, and one that speaks so deeply to my personal philosophy about our relationships with animals and our ethical duties to them. I feel so lucky to live in a time when we are constantly having conversations about doing better, and that I have a dog like Ruby whose sensitive, complex nature is a daily mirror for my own progress. P.S. 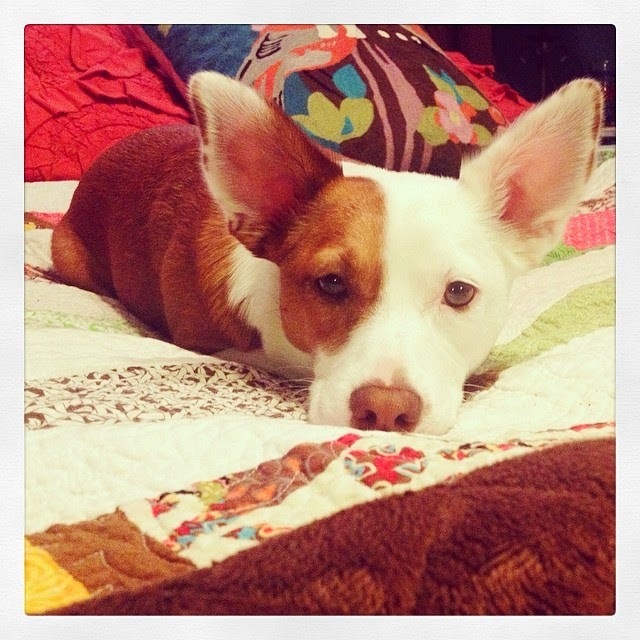 If you would like to see even more pictures of Ruby in various states of adorable, follow us on Instagram! 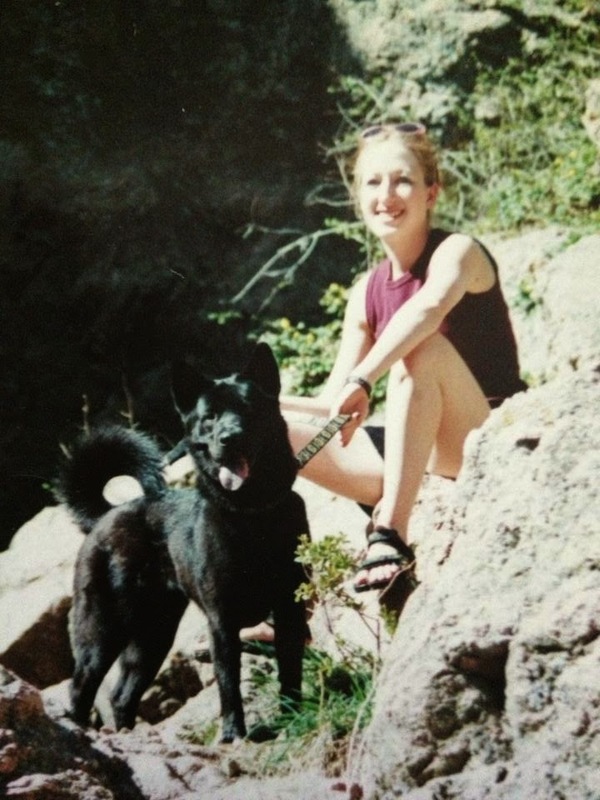 Hiking at Horsetooth Reservoir in Fort Collins, Colorado with my Chow/GSD mix, Lasya, not long after adopting her in 2000. I had no idea what I was going to do after college, and it wasn't the smartest time to get a dog, but my family had just lost our young GSD mix, Ripley, to a rare form of leukemia and life just didn't seem complete without a dog in it. I actually turned down a really cool job offer in upstate New York because I couldn't bring Lasya. She grounded me during uncertain times and kept me company as friends dispersed to summer and post-college locales. We moved many times together and she always adapted easily, staying with friends and family and getting along with all other dogs. She loved being outdoors and was a wonderful hiking partner. You can't tell in this picture, but both my sandals and Lasya's leash had a moon-and-stars pattern! Instant Patio Poop Bag Dispenser: It's not even fair to call this a DIY since there is one step: turn a flower pot upside down and thread a roll of bags through the opening. 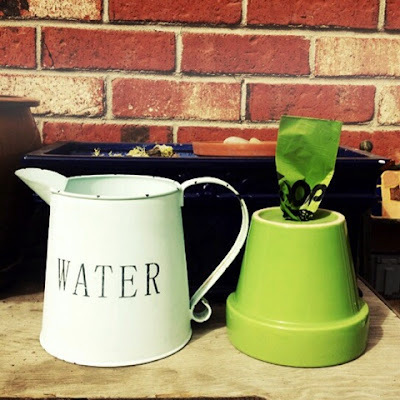 If you wanted to get really fancy you could paint a funny phrase or a cute design on the flower pot. 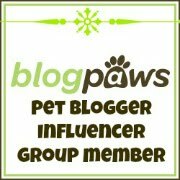 This is the Blog Paws Wordless Wednesday Blog Hop! 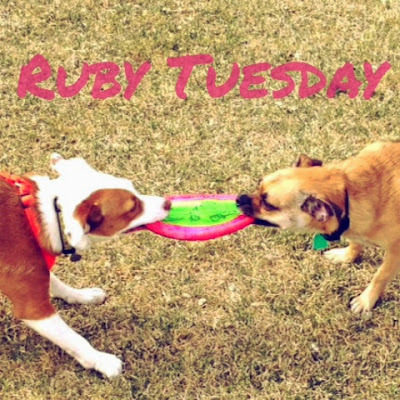 No fooling here - it's Ruby Tuesday! Ruby and I had a lovely, if too-short weekend - aren't they always? Our biggest news, aside from my fostering announcement that I made yesterday, is that thanks to Jessica of My Imperfect Dog, I've finally found a harness that I'm pleased with for Ruby. I've spent a small fortune trying nearly every variety there is: front clip, no-pull, easy-walk, etc. and maybe it's from my background in horses, where fit and function of equipment is of the utmost importance, or maybe I'm just extremely picky, but I was disappointed in each and every one. The front-clip are a nice idea in theory, but unless the leash has a very tiny (worryingly flimsy) clip, it's banging on the dog's chest, and the leash ends up between the dog's legs more often than not. Additionally, I found that Ruby seemed very uncomfortable with the chest strap always constricting her shoulder span, and she walked in a twisted sideways manner. Some front-clip harnesses are easily escapable so I needed to jury-rig them to her collar with a carabiner, thereby inhibiting the side-pull mechanism and putting stress back on her neck which defeats the purpose. More traditional harnesses would fit around the barrel but not across the chest, and I felt they were always riding up on her shoulder blades. 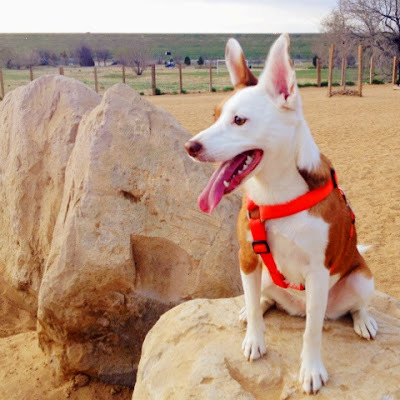 When Jessica expressed those same woes in finding a harness for Silas, and we compared notes on our quirky dog-twins, I decided to give her recommendation - the Lupine Roman Harness - a try. 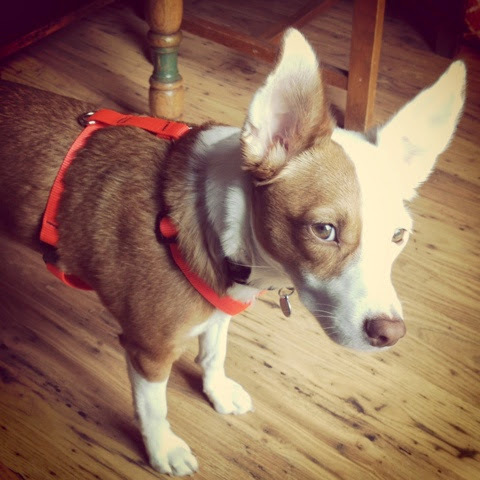 Despite Ruby's skeptical side-eye, I am thrilled to report that this harness is perfect. It's extremely adjustable, fits snugly across her chest and appropriately around her barrel, is easy to get on and off, doesn't choke her, and I think it is secure enough that it doesn't need to be attached to her collar. In fact, I've ordered an adorable matching ID tag for the harness itself. The orange is...unmissable, and brighter than I'd like, but it was the best color to match my new favorite leash, the Alite Boa Lite. I put together several of the rejected harnesses and donated them to a local shelter, though I kept the Sense-ible (her first harness) and the Freedom that sort of fit. Ruby's leash-walking manners leave much to be desired, so I did take her on a little refresher jaunt back in her Halti, something I plan to do once in a while. It does make a big difference, but feels like cheating. I've started being very conscious of keeping slack in the leash by changing direction or simply stopping until she checks in with me, and I am noticing some improvement. The swarms of rabbits that inhabit my complex don't help one bit. On Sunday, Ruby met her chug chum at our usual ball field; however, there were already about six other dogs there. Several large, rowdy ones, including a chocolate lab that was acting pretty aggressively through the fence, and what appeared to be two Shar-Pei puppies but what I think were actually Shar-Pei/Pug mixes. I didn't like the energy and could tell that Ruby was going to get overwhelmed immediately by the big dogs so we left in search of a quieter setting. We were able to find another empty ball field nearby, and although there were a few gaps in the fencing I thought as long as the dogs were focused on playing it wouldn't be an issue. Ruby ran laps with her flying disc in her mouth before giving it up for some fetching. She doesn't catch it mid-air, instead waiting for it to stop moving before she goes after it, reminding me of my non-athletic self in grade-school P.E. She and Cosmo even played tug briefly, although Cosmo is not big on toy-sharing. Ruby's energy is boundless and I think she would have been happy to stay there for another hour, but I had a brunch date downtown. 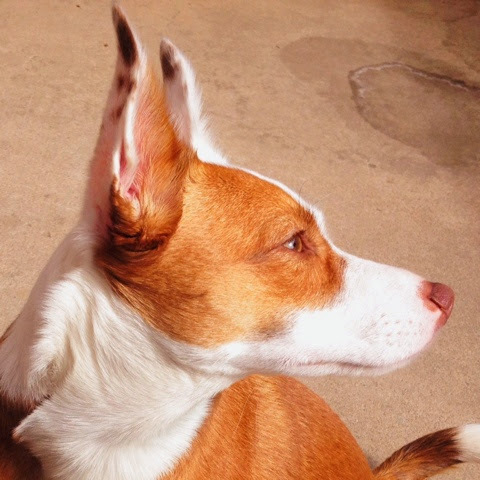 April should be a lively month with more and more beautiful weather and the arrival of our foster potcake dog! We are also looking forward to trying yet another subscription box, courtesy of a Bugsy's Box giveaway from Lapdog Creations. I'm excited to see all of the creative posts from those of you taking part in the A to Z Blogging Challenge, and hearing about your springtime adventures!